Birth, marriage and death (BMD) records from The Hague are not included in Genlias, the national database of BMD records. The Municipal Archive of The Hague does provide scans of BMD records on their website. Unfortunately, there is no index to these records, and the website is entirely in Dutch. So, even though BMD records from The Hague are available online, it is very hard to access them. Records are accessible via contemporary indexes, called tafels or klappers. These are also scanned and available online. Some of these indexes are typed, most are handwritten. Start your search in the indexes by clicking the button "Zoeken via toegang". Fill in the fields for Naam (name) and Periode in jaren (first and last years of the search period). You can limit your search by choosing a location from Gemeente of instelling (choose Alle gemeenten en instellingen to search all locations, or 's-Gravenhage for The Hague only) and type of record from Bron (choose Alle bronnen to search everything, or Tafel geboorten, Tafel huwelijk en echtscheiding or Tafel overlijden to limit your search to births, marriages/divorces or deaths, respectively). Press the Zoeken (Search) button. Make your choice from the results list. 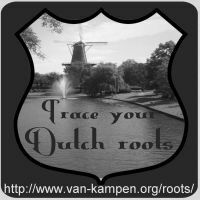 The list is in Dutch, so you may want to use my Dutch genealogy dictionary to help you understand what you're choosing. You should now see a list of greenish buttons labelled Afb.1, Afb.2 etc. (Image 1, Image 2, etc.) Click these to see the scans of the indexes. You need to browse these scans to find the information you need. When you find the people you're looking for write down the date that's listed. Note: If the date is not written in full it will be in the form day-month-year, never month-day-year. The date is the date the act was written, not the date of the birth or death. Fill in the date under dag maand jaar (day month year) at the top and click Document zoeken. The greenish buttons that appear now will take you to the scans of the documents you were looking for. These are ordered by date, and you will need to browse to find the right one. When you finally succeed locating the record you were looking for, the next challenge starts: Understanding a handwritten Dutch document. My article Reading Dutch birth acts may be helpful when you are trying to make sense of Dutch acts. Finding information on the website of the The Hague archives is a difficult task. I would like to hear from you if this post helped you to find the records you needed, and if not, where you got stuck. You can add a comment below this post or write in my guestbook (your comments will be visible to everyone) or via the feedback page (your comments will be visible for me only).